Ty Dolla $ign Ty Dolla $ign Embarks on Don`t Judge Me Tour Next Month! 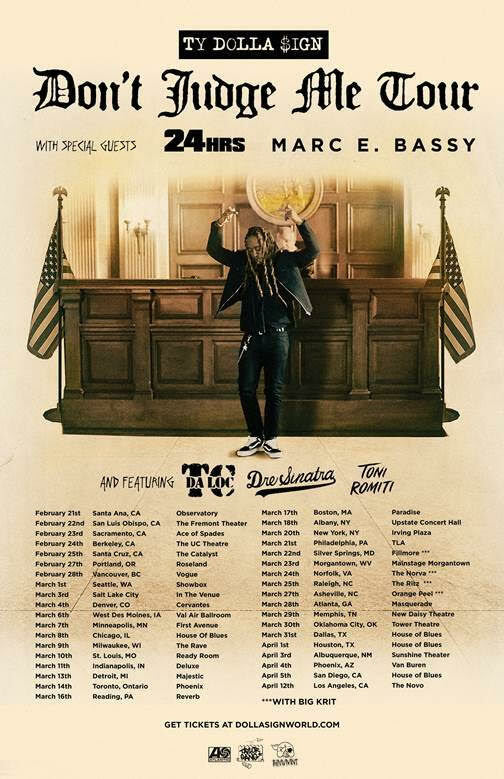 Ty Dolla $ign Embarks on Don`t Judge Me Tour Next Month! One of the most sought out names in music, GRAMMY-nominated singer, songwriter and producer Ty Dolla $ign is headlining the Don't Judge Me Tour next month in celebration of his long-awaited sophomore album BEACH HOUSE 3 in a city near you. Fans will experience his classic cuts and cult favorites from the album -which Pitchfork called "a superbly refined collection of songs, carefully crafted, smartly cast, and ruthlessly listenable-“ plus, some songs will be performed live for the very first time! Fans will also enjoy live instrumentation from the hip-hop superstar, and some special surprises- Ty is known for bringing a few of his celebrity friends out on stage during his set! You don't want to miss it! See full tour itinerary below. BEACH HOUSE 3- which marks the long-awaited follow-up to the star’s 2015 breakthrough debut album, FREE TC – made a stellar chart debut upon its October arrival, landing at #8 on Billboard’s “Top R&B/Hip-Hop Albums” chart as well as #11 on the overall Billboard 200. The album includes a number of critically applauded hits, among them “Dawsin’s Breek (Feat. Jeremih),” “Ex Feat. YG,” “Love U Better (Feat. Lil Wayne & The-Dream),” and “So Am I (Feat. Damian Marley & Skrillex).” The album received a wide range of acclaim and was named one of the Best Albums of 2017 by Rolling Stone, XXL, SPIN, HotNewHipHop, Rap-Up, LA Times, and more.